Palm has released a software update for the Palm Treo 800w . If your device fails to detect any of the in-box USB accessories such as the power adapter, headset or sync cable, this update will resolve most of the detection issues. When plugged into the charger, the device may not charge a completely discharged battery. This scenario is most likely to happen if you leave a dead battery for a few days before trying to charge it in the device. If the device will not turn on to install the update, you should “trickle charge” the battery by connecting your device to a PC via the USB sync cable. The device will charge slowly by using the PC’s power. When the device’s battery indicator shows 25% charged, you can proceed to install the update. Palm “highly recommends” installing this update. You download the free update directly from Palm . of your Bluetooth headset or car kit to initiate voice calls on your Treo 800w via Voice Command voice dialing software. Palm has set up a list of compatible Bluetooth devices. You can download from Palm or direct to your Treo 800w by visiting www.palm.com/800wota. Discuss this update and more in our Treo 800w forum. 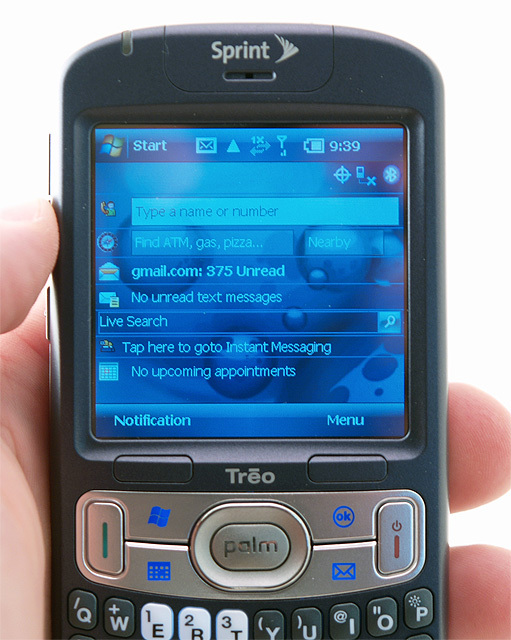 It’s hard to believe that we haven’t seen a new Windows Mobile powered Treo from Palm since January of 2007. During that time, we’ve seen evolutionary changes to the Palm OS based Treo and a repackaging of the Palm OS in the “built for fun” Centro smartphone. The Treo brand has long been the flagship for Palm, but in the past year the Centro has been front and center. While the Centro is certainly a capable, value-based smartphone, it does lack the fit and finish of the higher end Treo series of smartphones. It seems that Everything Treo, along with most other tech blogs, have been talking about the Treo 800w for quite some time. So here it is, how does it stack up in this new era of smartphones and do the new features make the Treo 800w a worthwhile upgrade? Read on for our take on the new Treo 800w. 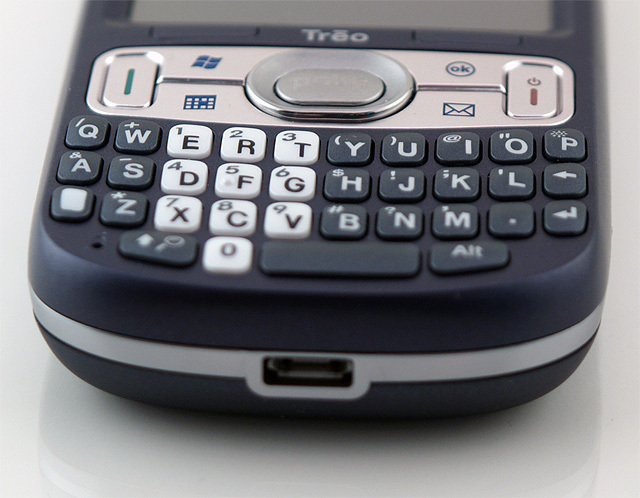 Like any Windows Mobile device, the Treo 800w offers a host of features. 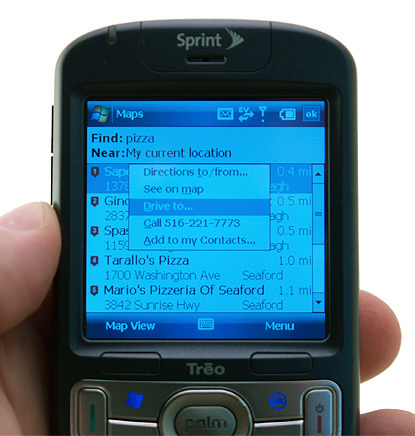 From the Today screen, you can either dial a number directly or start typing the name of a particular contact that you’d like to call and the Treo 800w will automatically search both first and last names providing you with a convenient list of filtered contacts making it easy to place your call. You also have easy access to an old fashioned dialing pad. The dial pad is responsive and numbers will also “flash” orange when you select them. Call quality was great and volume was more than adequate. It’s not as loud as a Motorola Q, but few phones can match Motorola’s prowess when it comes to phone call quality. Pressing the green “call” button will also provide access to recently dialed numbers, or access to either the dial pad or call log. The call log offers duration of calls and the ability to filter based upon your selection (Missed, Outgoing, Incoming). Once in a call, it was easy enough to switch to speakerphone or put a call on hold. The Treo 800w does a fantastic job of integrating your contacts, managing your calls and making your phone work for you. You’d be hardpressed to find a smartphone that offers robust call management features in line with the Treo 800w. From a usability perspective, Windows Mobile can be a daunting operating system for some. Out of the box, the operating system does little to welcome the user. Thankfully, Palm acts as an intermediary between the OS and the end user. Palm’s software tweaks make the operating system more approachable and in general they just make things easier to use. Search contacts by first, last or company name. View number of unread text messages and access your messages. Search the internet using Microsoft’s Live Search. This is just from the Today screen and only a part of what Palm brings to a Windows Mobile device. The features alone do not make this device a Treo, it’s the tight integration of the Today screen with the OS that makes it a power users best friend. There are also small, yet useful enhancements. For example, phone numbers that appear in web pages or an email can be dialed by tapping on the screen. 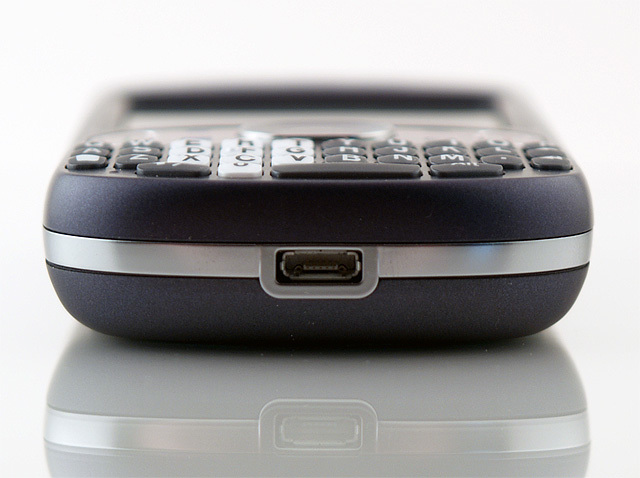 There is a small switch at the top of the Treo 800w which allows you to switch from ringing to vibrate mode. Having a physical switch is not only easier, but more efficient than devices that require you make the change in the OS. If you have to jump into an improptu meeting, you can switch the ringer to vibrate mode without removing the Treo from it’s case or holster (which unfortunately is not included). There are two new features that debut with the Treo 800w: GPS and WiFi. First up is GPS. The Treo 800w is built for business. Having done my fair share of business travel, there is certainly a need to find local eateries, ATM’s and directions to those locations. From the Today screen, I was able to search for ‘pizza’ near my location. Within seconds, I had a very accurate list of pizzeria’s near my location. You can view the POI’s in either map view or list view. Need to call before hand for reservations, the Treo 800w provides the option to call the phone number. Need directions? Selecting Drive To… launches Sprint Navigation, a 3D turn-by-turn route guidance software that comes bundled with the Treo 800w. You won’t find it compares with a high end Garmin, but overall it’s very good and it’s built into your phone. It took sometime for Palm to build in GPS and they have done a very good job of bringing it all together. Instead of just adding a feature, Palm has taken it once step further and made the GPS an easy to use feature. 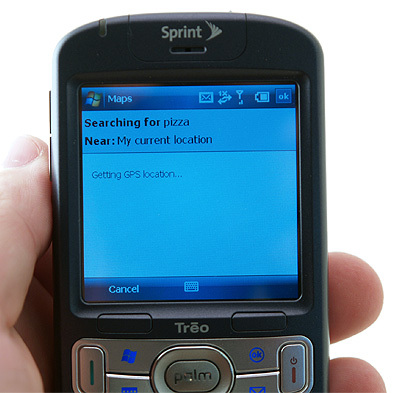 The GPS on the Treo 800w allows you to search for POI’s near your current location. Any wireless service can be spotty and at times frustrating. For many WiFi helps fill in the gaps and the Treo 800w represents the first Treo to offer WiFi. At the top of the Treo 800w is a dedicated WiFi button. 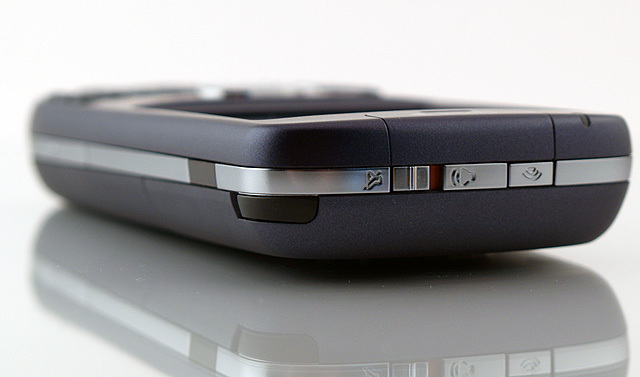 Once you’ve configured the Treo 800w to a WiFi network, the once touch WiFi button turns the feature on/off. An ascending on descending tone will confirm your choice. The addition of a one-touch WiFi access is a surprisingly nice touch and one I didn’t see coming. The Treo 800w takes some design cues from the Centro and merges them with the Treo 750. The overall build quality is excellent and that’s always been the mark of a Palm’s Treo series. It’s hard to put into words, but the device just feels like care when into the design and construction. Typing on the QWERTY keyboard is fast and offers responsive tactile reinforcement that resulted in error free typing. One surprising mistep was the included stylus. It’s lightweight, but that’s about it. Quite honestly, it’s not usable and you can plan on purchasing a suitable replacement once they become available. With a device that is so well constructed, I cannot understand how or why this stylus design was chosen. Also new with this Treo is the inclusion of a microUSB, which replaces the old Palm multiconnector. Despite the need for new Treo 800w accessories, this is a welcome change and has become a bit of a standard on smartphones including RIM’s BlackBerry devices. Palm includes a sync cable, but I’d certainly recommend a car charger. With a smaller device comes a smaller battery. I used the vast array of features on the Treo 800w and the battery lasted until early evening. Granted I used Navigation, Sprint TV and WiFi, but be prepared for less than stellar battery life when using those features. If your day to day consists of calls, productivity apps and email, the battery should be more than suitable. If you plan on taking advantage of everything the Treo 800w has to offer, you might want to consider carrying a spare battery or have access to some method of charing. Removable media on the Treo 800w changes to the smaller microSD. While a more expensive memory expansion, it no doubt contributed to Palm’s ability to slim down the Treo 800w. Here you’ll find familiar programs from Office Mobile to Instant Messaging which allows you to access AIM, MSN Messenger and Yahoo Messenger. One noteworthy addition is Sprite Backup, a third party application valued at $29.95 that comes standard on the Treo 800w. Sprite allows you to easily back up all of your critical data and easily restore it should the need arise. One great thing about Sprint carrying the Treo 800w is the inclusion of Sprint TV, a service that allows you watch live television on the Treo. The standard package offers a nice selection of programming, with premium offerings also available. In our tests, the Treo 800w accessed Sprint TV in no time and there were zero buffering issues. If you don’t currently own a Slingbox, SprintTV is the next best thing and it’s included. Thumbs up! 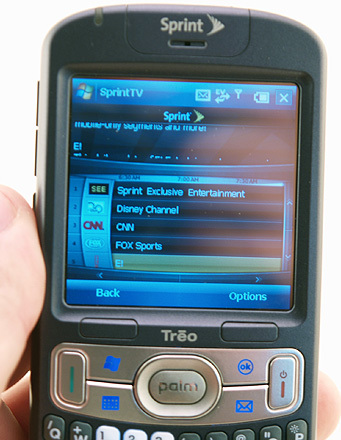 Sprint TV offers a number of channels on the Treo 800w allowing you to watch live TV. Yahoo, AIM and MSN Messenger are all included. With changing standards (ie. 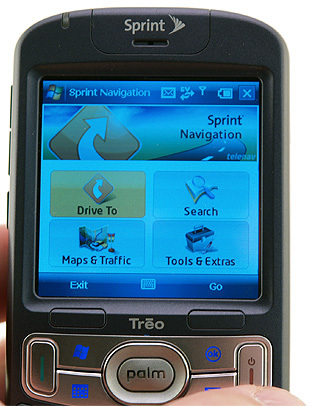 320×320 resolution screen), comes heartache that some applications will not be compatible with the Treo 800w. When a major manufacturer such as Palm releases a new phone, you can expect developers to get on board. I certainly advise readers to contact developers if there is a particular app that you must use on the device. Expect developers to adapt to the new display, which was hardly a secret. The Treo 800w retails for $599, but after rebates and a 2-year agreement, the price drops to $249. While it would be nice to see it fall below the $200 plateu, it’s certainly understandable given the feature set and bundled software package. 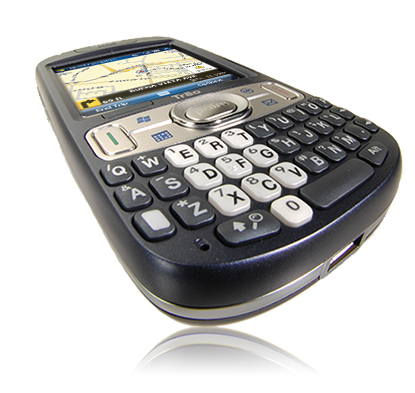 The Treo 800w represents the complete package offering WiFi, GPS, support for EVDO- REV A. and Windows Mobile 6.1. When you consider the included software bundle (Sprint Navigation, Maps, Sprite Backup, Sprint TV, Office Mobile), it’s easy enough to justify the price point. Battery life could have been better and the included stylus was not in keeping with the overall good build quality of the Treo 800w. The 320×320 resolution was a bonus when reading Office docs and you can expect major developers to provide updates that are compatible with the new device. Overall, I found the Treo 800w to be a peppy, full-featured Treo that represents an nice evolutionary move from the Treo 750. Palm has once again proved they understand how people use their phones and delivered a powerful, yet easy to use smart device in the Treo 800w. We continue to put the Palm Treo 800w through the paces for our upcoming comprehensive review which you can expect shortly. 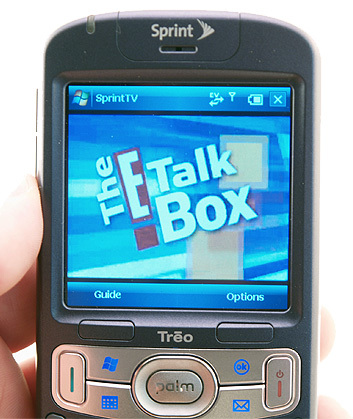 One of the features of the Treo 800w is Sprint TV, a service that is available only through Sprint. They offer a nice cross section of channels including CNN, Disney and my favorite the NFL channel. More impressive are the super fast load times and Sprint TV makes the most of the new 320×320 resolution screen. Within seconds, we were watching live TV on the Treo 800w and did not experience any buffering issues. Check out our video of Sprint TV on the Treo 800w featuring none other than Dallas Cowboys wide receiver Terrell Owens. Plan on getting the Treo 800w? Get your popcorn ready! Join us as we unbox the new Palm Treo 800w available starting today from Sprint and Palm. The new Treo 800w represents a major shift in hardware design for Palm with a new form factor and robust features including integrated GPS, WiFi and support for Sprint’s EV-DO REV. A for broadband type speeds. 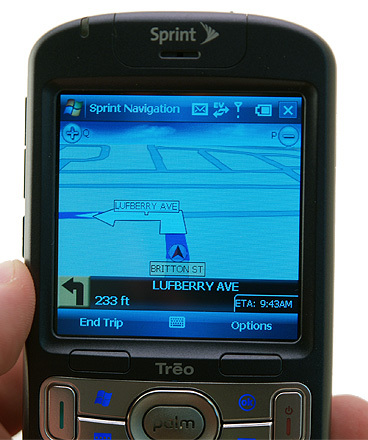 The new Treo 800w also features a 320×320 high resolution screen, yet another first for a Windows Mobile powered Treo smartphone. In addition, the new 800w also runs Windows Mobile 6.1 and it’s the first smartphone from Sprint to ship with the new OS. Check back often as we’ll have Treo 800w features all week. You can discuss the new Treo 800w in our forums. Palm, Inc. and Sprint today introduced the Palm Treo 800w, Sprints newest smartphone with Windows Mobile 6.1 Professional. Designed for business users who depend on their smartphones for high-speed productivity on the go, the Palm Treo 800w operates on the Sprint Mobile Broadband Network and comes out of the box with support for EV-DO Rev. A data speeds, WiFi for data and GPS capabilities. The Treo 800w is Palms most business-friendly phone yet. IT departments can simplify infrastructure and lower costs with a direct connection to Microsoft Exchange Server, giving users up-to-date email, contacts, calendars and access to other productivity applications. Palm designed the Treo 800w for easy-to-use mobility with a full QWERTY keyboard, five-way navigation and one-touch buttons to the most-used applications, making it a smartphone people want to use. As Sprints first smartphone to ship immediately with EV-DO Rev. A network support, the Treo 800w offers customers the ability to quickly browse the web and send and receive emails even those with large attachments at broadband speeds. The vast majority of Sprints Mobile Broadband Network has been upgraded to EV-DO Rev. A technology, providing Treo 800w users blazing-fast speeds on the nations largest mobile broadband network (based on covered square miles). The Sprint Mobile Broadband Network (inclusive of data roaming) reaches more than 246 million people, 16,022 cities and 1,506 airports and brings customers instant gratification so they can work fast and on the go. With EV-DO Rev. A, peak network download data rates increase to 3.1 Mbps and peak upload data rates increase to 1.8 Mbps; average download speeds improve to 600 kbps to 1.4 mbps and average uplink speeds increase to 350-500 kbps. Palms WiFi hardware and software innovations make it easy to get online fast and manage network connections and power usage. The one-touch WiFi button provides a clean, uncluttered WiFi experience that gets Treo 800w users rapidly connected at home, in the office or in WiFi hotspots. (2) It includes 802.11b/g WiFi and built-in Internet Explorer Mobile, which means faster, more secure access to web-based data. With integrated GPS and Palm software enhancements, the Treo 800w smartphone offers maps, point-to-point directions and point-of-interest (POI) searches for locations such as restaurants or stores. POI search is available directly from the Today Screen and is integrated with contacts, giving customers one-touch access to the places they want to go. 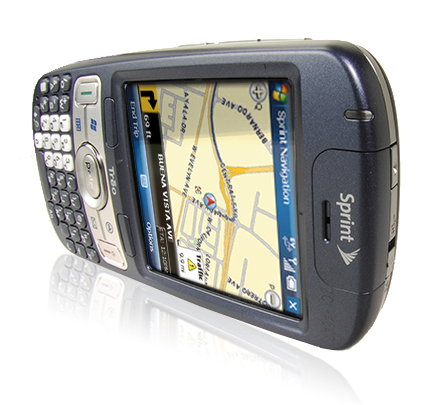 Treo 800w also supports Sprint Navigation for turn-by-turn directions as well as other popular third-party location-based services applications. Companies looking for more control, centralization and security will find the Treo 800w an attractive choice. It connects directly with Exchange Server 2003 SP2 or 2007 and works within a companys existing Microsoft infrastructure, eliminating costly middleware or the maintenance of additional servers. The Treo 800w extends business capabilities by providing a familiar Microsoft Windows experience while on the go to keep employees productive. With thousands of applications available for Windows Mobile, businesses can extend mobility beyond email to optimize business processes whether in sales or out in field. The Treo 800w comes fully equipped with easy-to-use professional email. Microsoft Direct Push Technology is available out of the box and gives users connected to a Microsoft Exchange Server fast, automatic wireless updates from their email, calendar, contacts and tasks. Users can download email attachments to view and edit Microsoft Word and Excel files, view PowerPoint and PDF files, and open ZIP files. The Treo 800w is compatible with Microsofts System Center Mobile Device Manager 2008, which delivers increased security and easier smartphone management as well as access to information on the corporate network via mobile VPN. IT professionals can confidently manage large Treo 800w deployments the same way they would expect to manage PCs with a low-cost, reliable solution that fits seamlessly with their existing IT infrastructures. Palm is adding a unique stamp to the Windows Mobile experience with the Treo 800w, said Stephane Maes, vice president, product marketing, Palm, Inc. Its an easy-to-use feature-packed smartphone that will keep users happy, empowered and productive. Palm ease-of-use features — hard buttons for email and calendar, a five-way navigation button and on/off ringer switch. Sprint recognizes that businesses must stay productive and competitive with quick, always-accessible information and assistance for their own customers, said Michael Hahn, vice president of device operations for Sprint. With instant access to email, messaging services and the web on the nations largest Mobile Broadband Network, Sprint provides its customers the mobile tools they need to increase productivity and improve competitiveness now. In addition to the valuable business-friendly features delivered through Palm and Windows Mobile 6.1, new business applications are being created through Sprints newly launched Professional Developer Program and with tools such as the Titan platform for Windows Mobile 6.1 devices. A growing community of application developers who may previously have focused on desktop services are now finding it easier to generate services that can perform on both the desktop and mobile devices. Sprint TV allowing users to watch live TV or video-on-demand with full-motion video or catch the latest news, sports, weather, entertainment and movie trailers on the go. Choose from more than 50 live television channels and watch programs such as CNN mobile, FOX sports and E! Entertainment; access NFL Network and special programming via Sprint Exclusive Entertainment. Sprint Navigation delivers turn-by-turn voice-guided and on-screen driving directions, 3-D moving maps similar to an in-car navigation system or personal navigation device, as well as local search, intelligent traffic alerts and one-click rerouting. Pocket Express to retrieve customized, up-to-date web content such as sports, weather, news, money and movie information with the push of a button. 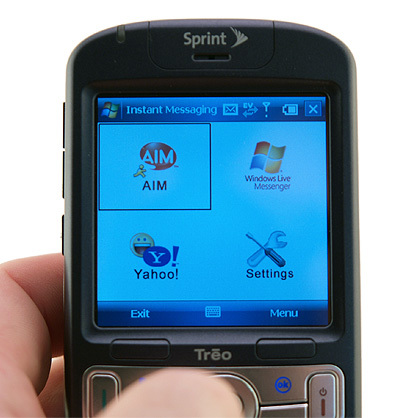 Sprint IM extends instant messaging to the Treo 800w with access to Yahoo! Messenger, AOLs AIM service and MSN Messenger. 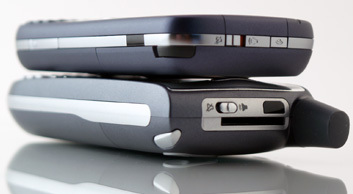 The Treo 800w is available today for consumers and businesses at Sprint Stores, online at www.sprint.com or www.palm.com, and through Sprint or Palms B2B sales organizations. It will be available for $249.99 after discounts and rebates with a two-year contract. To receive the best value and experience the full capabilities of the device, customers must subscribe to a pricing plan offering unlimited data. Customers can choose from Everything plans for individuals ranging from $69.99 per month for 450 voice minutes and unlimited data or the Talk/Message/Data Share plans for families starting at $129.99 per month for 1,500 voice minutes (shared between two lines) and unlimited data. Sprint also offers its signature Simply Everything plan offering both unlimited nationwide voice and data services for just $99.99 per month. Customers may also choose one of Sprints Individual Talk Plans and add on the $30 per month Pro Pack to take advantage of data capabilities. It appears the Sprint Treo 800w User Manual had a brief stint on Sprint’s support website, before being pulled sometime today. The guide has now been replaced with a single page PDF that simply states, Palm Treo 800w User’s Guide, Coming Soon. It’s widely rumored that the Palm Treo 800w for Sprint Wireless will be announced very shortly and represents one of the most widely anticipated Palm Treo smartphones in recent history. 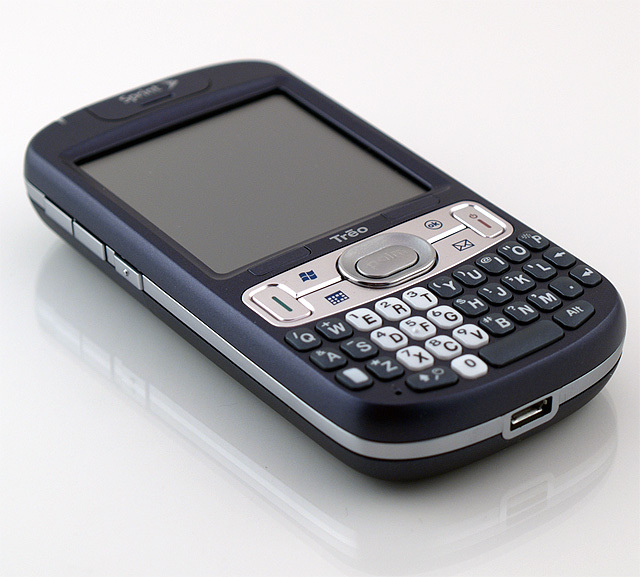 We have yet to receive an official release date from either Palm or Sprint on the Treo 800w. As soon as we receive word, we’ll provide further details and a comprehensive review. You can discuss the upcoming Treo 800w in our forums. According to a rumored inventory document on HowardForums, the Sprint Treo 800w will make it’s long awaited release date on July 13th, a week prior to the previously rumored release date. Business channels could see the Treo 800w as soon as July 9th. The unsubsidized price is $599, but of course we expect to see a few instant rebates knock down the price quite a bit. Stay tuned and we’ll pass along all the details as they become available from Palm and Sprint. Sprint has had a tough time holding onto customers, but have started off the summer with a bang releasing the Samsung Instinct and now the Treo 800w. You can discuss the new Treo 800w in our forums.